An observer would have had a difficult time reckoning the man�s age. The hair was jet black, as glossy as a raven�s feathers, without a hint of grey. Nevertheless, the eyes were penetrating, and old, and shadowed, not from fear, but as if to keep in Knowledge, the Knowledge of many years, years beyond counting as ordinary men can count them. He was not tall, not so tall as the typical man of this era. Yet he stood erect, and confident, and never failed to meet the eyes of anyone he came in contact with. He was slender, but not gaunt, and there was an obvious strength, as well as grace and agility, whenever he moved. He could not have been called handsome, but the very intelli- gence in his face, his manner, his easy way with a person, made him attractive. Moreover, the attraction was not solely of a sexual nature. In his long existence, the man had had dalliances, as well as profound passion, and not only with women. But people of all ages, all backgrounds, felt them- selves charmed by him. Moreover, it was not, for the most part, a magickal allure. The man himself was the enticement � magnetic, fascinating, seductive, sometimes maddeningly so. If he had ever had a True Name, he never knew it. He had never been able to find out where he came from originally. He remem- bered nothing before waking, naked and alone, on a grassy meadow around the year 500 BC, in what is now called Croatia. He had language, the language of the local Dalmatic tribes. He had skills � he was an excellent artisan, a wood carver, a potter, and a weaver. He was an incomparable huntsman � his arrow always found its target, his spear always found his enemy�s throat. Nevertheless, no one knew who he was, or where he came from. Moreover, none knew, not even the man himself, why he could not die. The man eventually settled into a routine life in the village of Carrano. He took the name Barrachis, the local word for Stranger. Eventually, he married, a pretty village girl named Tha�s, and they had three children who survived infancy � sons, Arctus and Pelleon, and a beautiful daughter, Irina, who was golden like her mother, but solemn like her father. Nevertheless, things grew ominous in the village, as Tha�s turned grey and began to totter about in her old age; as his sons and daughter married and had children of their own; while Barrachis showed no signs of ageing. The day that his little Irina was buried, a withered sixty years old, was the day that things finally erupted. Villagers demanded to know why she had died of old age, while her father was still young and strong. The men came to his house, and dragged him out, calling him a witch, and an evil doer. They tied him to a tree, and stabbed him with their boar spears, even through the heart, and they shot arrows into his chest. Nevertheless, although the arrowheads tore his flesh, and the spears ripped through him agon- isingly, he did not die. His blood, instead of cascading from his body, dried up. The arrowheads worked their way out of his wounds and fell to the ground. In only a few minutes, he was whole again. Women screamed, and men turned pale. All fled as if from a demon. So Barrachis was left alone in the night, tied to a tree. He, too, was stunned: he had often wondered why he had never aged, had never even got sick. He knew that any wounds he took healed miraculously. However, he had not been prepared for this. So he hung from his bonds for hours, contemplating his life, his past, his future. He wished that he were free. Unexpectedly, the wish became reality, and the ropes fell to the ground. He stepped away from the tree, rubbing his aching wrists, and wondering what had happened. Barrachis did not know, at first, what to do. He knew that he could not stay in the village. His wife, his children, were all dead. His grandchildren, with families of their own, cringed away from him. He no longer had a connection with this town. Ultimately, he went back to his house, the door still open as his captors had left it when they carried him out. He packed a few things, things that were important to him, and he left. He did not flee however, like a burglar into the night. Instead, he waited until morning, boldly walking down the village�s only dirt road, saying goodbye to everyone as if he were merely going away for a visit. His heart ached, however, because all he had ever known was being left behind. Barrachis eventually made his way to Athens, where he met a sorcerer by the name of Antocles. Antocles was wise, and filled with Knowl- edge, but, alas, he was mortal. When he died, some twenty years after their first meeting, he left his extensive collection of scrolls to the man who had been Barrachis. By this time, the man had learned much. He knew how to channel his magickal gift. He learned how to Remember spells, potions, curses, and cantrips. Thus he memorised Antocles� entire library, and he moved on. He was calling himself Ounon now, meaning Nobody. He went East in Alexander�s wake, and it was in Persia that he met a man called Ahurakses. Ahurakses, like Antocles, was a sorcerer, called a Mage in Persia. However, unlike Antocles, for whom Knowledge was the supreme god, for Ahurakses, nothing was as important as Power. He had managed to enslave several minor Djinns, and they kept him in barbaric splendour in a palace in the middle of the desert. There, he lived a sumptuous life, with young women and young boys for his every caprice. He rarely left the palace, preferring to spy on the world through a scrying glass. He noticed Ounon, work- ing magick in Persepolis, and he saw in him a potential rival. So he sent for him, tempting him with promises of great Enlight- enment. In reality, Ahurakses hoped to slay Ounon, so that he would not have to worry about Ounon becoming more powerful than he. Ounon discovered Ahurakses� trap, and the two fought a magickal duel in the middle of the desert. When it was over, Ounon stood victorious, Ahurakses� palace was a pool of melted rock, and the Persian�s enslaved Djinns were free. The Mage himself escaped, vowing vengeance. The grateful Djinns taught Ounon what they knew. They could not tell him who he really was, for there was a strange geas on that knowledge which prevented them from divulging it. Nevertheless, they taught him how to fly, and how to Shapeshift. The Raven became his favourite shape to transform into; he loved to fly at night, his ebony wings glittering in the lustrous light of the moon, the shadows below flowing by like rivers of darkness. The two married, and lived together for over one hundred years, but eventually, although their affection endured, they drifted apart. 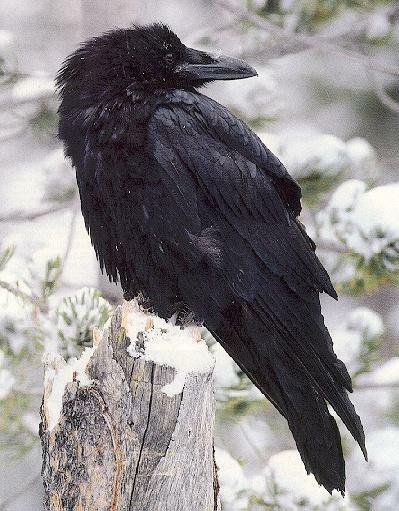 Corvus wandered through Africa, Britain, Gaul and Scandi- navia. Around the year 1000, he called himself Hrafn, and he voyaged with the Vikings as they cut their way through Europe. In the 1300s, he was set up as a Baron in a castle overlooking the Rhine. He called himself Falco von Rabensberg then, but the life did not suit him, and he wandered on. He was in Florence for the Renaissance. He was in England for the Restoration. He was in Tibet in the Eighteenth Century. He was in Paris when the Bastille fell. He was back in London for the reign of Victoria. In the year 1906, he decided to move to North America. He had been there before, briefly, after Cortez and De Leon. He had been back in the mid-1800s, but he left before the Civil War. Now, Europe had become too crowded. Trains shattered the still- ness of the night with their haunted wailing. A menacing war loomed on the horizon. So he decided that he needed room. He visited New York and Philadelphia, but they teemed with people and reeked of corruption. So he flew on, delighting in the empty prairies, but feeling their Loneliness too deep within him. He paused to study with the Cherokee, and the Lakota, and the Navaho, and then he moved on again. Finally, he came to the shores of the Pacific, near a small town called Los Angeles. And there, he felt a Rightness, a font of mystic Power. He located a headland overlooking the sea, a place where the Power was strong, and there he built a castle. And there he took a new name. He was Corvus the Bold, Mage of the Western Wastelands.